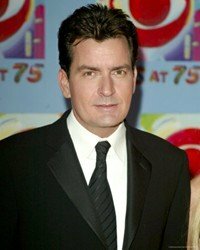 Charlie Sheen was born Carlos Irwin Estévez in New York City, the youngest son and third of four children born to actor Martin Sheen and artist Janet Templeton. Sheen's film career began in 1984 with a role in the Cold War teen drama Red Dawn with Patrick Swayze, C. Thomas Howell, Lea Thompson, and Jennifer Grey. In 1987, he starred with his father in Wall Street. Sheen was the 2004 spokesperson for the Lee National Denim Day breast cancer fundraiser that raised millions of dollars for research and education regarding the disease. Sheen stated that a friend of his died from breast cancer and he wanted to try to help find a cure for the disease. Sheen also launched clothing line for kids, called Sheen Kidz in 2006. See this video of Charlie Sheen in an episode of Two and Half Men.